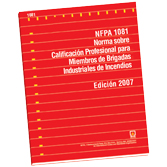 Ensure that fire brigade members are qualified to meet the challenges of a demanding job with the 2007 Spanish edition of NFPA 1081! NFPA 1081 establishes minimum job performance requirements necessary to perform the duties as a member of an organized industrial fire brigade providing services at a specific facility or site. Knowledge and skill criteria are provided for the levels of industrial fire brigade operations defined in NFPA 600: Industrial Fire Brigades.